You can keep self-driving cars – they’re frankly scary – but futuristic technology absolutely has its place, as far we’re concerned. Cordless vacuum cleaners, Coravin systems and thermostats that you can email to turn the heating on for when you get home are all great steps forward for mankind. As is the advent of the bean-to-cup espresso machine. Dry January might be stopping you from popping open a bottle of wine every night like you did in December, but there’s nothing to stop you filling that void with beautiful coffee made from freshly-ground beans with a single touch of button. This shiny chrome model has a post-Christmas-friendly price tag, a Best Buy award from Which? and comes with an optional (and pleasingly-named) ‘steam wand’. Why wipe your feet on plain brown jute when you can wipe it on a delightful flowery scene? That’s the promise of the first item on our list this week, an unusually colourful ‘Garter Blue’ floor mat. 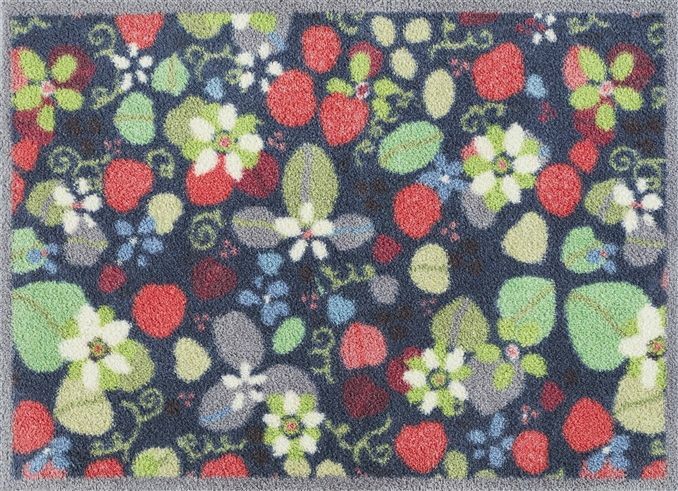 With the nights seeming longer than ever, coupled with the promise of a new ‘Beast from the East’ on the horizon (and this time we’re not talking about our office air conditioning), the bright colours and floral designs on this mat could provide a level of escapism to make you forget all about the fact that we are still in the depths of winter. Well, maybe. This beautiful cotton nightshirt by Siân Esther is exactly what you would call utterly inessential – particularly in chilly mid-January. Made of 100% cotton, this soft and elegant nightshirt wont exactly keep you warm… But it really is gorgeous. Accompanied by a drawstring bag that is ‘perfect for taking on travels’, so you can either book a holiday lickety-split or maybe invest in some pyjama bottoms and a wooly dressing gown. Harry goes on to confess a ‘special fondness’ for tawny sherry, the darker variety that’s aged in the barrel instead of the bottle. Try Taylor’s 10-year-old, he says – it has a ‘winning combination of nuttiness and freshness and can be drunk (in small doses) at any time of day.’ That sounds almost like an instruction to try some with Sunday brunch. There’s no better time than the depths of winter to get cosy in front of the fire with your nearest and dearest. Now that all of the semi-decent Christmas television has passed us by, many of us are looking elsewhere for entertainment. Well, look no further for some good old-fashioned dominoes-and-dice gaming fun. Made from the finest leather with alcantara lining, this bag of games from Williams & Son contains things such as dominoes housed in a fine leather box, a leather magnetic chess/backgammon board, and leather dice cups for playing liar’s dice – aka perudo – in style. £4,905 for a lifetime’s entertainment – and a good way to persuade your other half that £299 for an Xbox isn’t such bad value after all. If you purchased our entire shopping list this week you would have spent £5,362.25 and be onto a truly cracking Friday night in. Send my invitation for next week, please.